Firstly – your own perception of being a tall women and how other women feel about that. 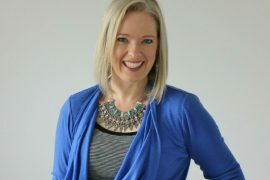 For some reason (and I’m guessing that one woman, some woman, sometime in your past said that she was intimidated by tall women), you feel that your height intimidates. You have taken this comment to heart and believe it to be true for everyone. Secondly – Height does give you an element of Yang (strength, power and authority). So in a way point one could be true. But I would like you to consider yourself as a whole, rather than just your height. There are many elements of your physical appearance and personality that may actually balance your height out and make you approachable. 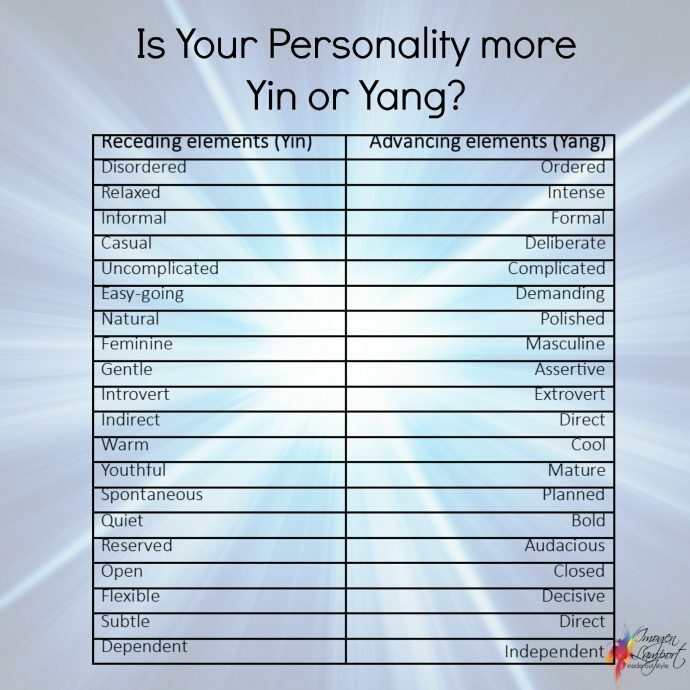 Go through the checklist of Yin and Yang physical traits here and see if you are overall more Yin or Yang (or balanced) with your physical presence. Now consider your personality. Read the table below and mark which most applies to you (the majority of the time, not what you “can be” if you “have to be”). You may sit one side or other of the mid-line – or you may sit right in the middle between the two personality traits. Once you have completed the table above, count up how many ticks you have put on the Yin side and how many on the Yang side. Anything that falls on the mid-line can be ignored. Then notice if your personality is more naturally yin or yang? Now your combine these results with those of your physical appearance and you can start to see if you really are intimidating or not. Whether your physical traits and personality really are more one way than the other. 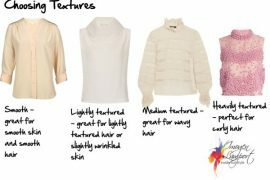 If you are naturally more yang, then consider adding some extra softness or yin elements to your outfits to balance your personality and make you appearance more approachable. You may discover that in fact you are fairly balanced naturally, so that your heels and height are completely fine! Or in fact maybe your personality is naturally more yin and you need those heels to give you some strength! 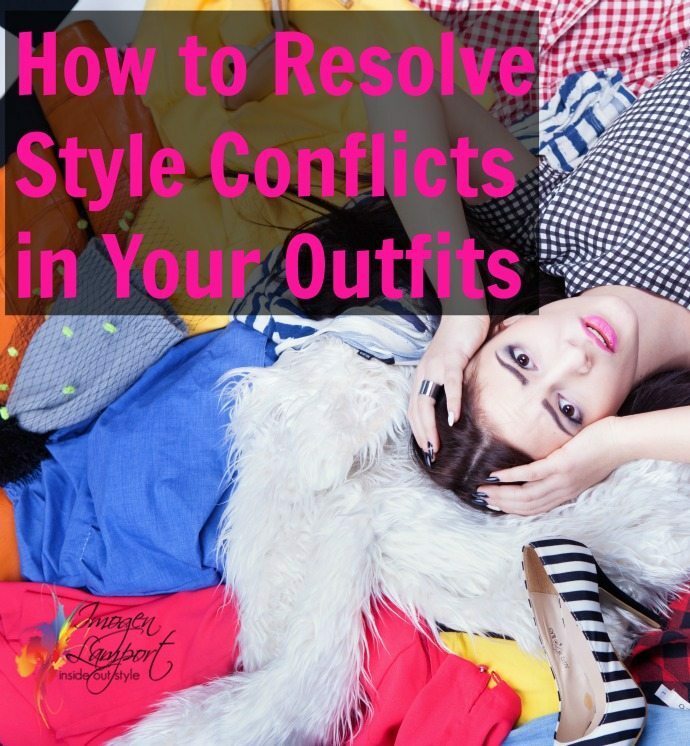 If you are interested in a really comprehensive set of questions and tests to discover more about your overall yin and yang, your entire physicality and personality (the above is a shortened version), this is available in my 7 Steps to Style program. This is very helpful even though height is not an issue for me at 5’3″. My personality is very yang but my emotions are more yin. When I worked I definately dressed very yang and it suited the situation. Now that I am retired I want to still be seen as a direct, decisive, etc. but very approachable. I have been softening my style and will continue to do so. This is really interesting. I am 5’0” so I tend to go in the opposite direction, people do not consider me intimidating or authortative at all. I figured out early on if I wear heels and then have my pant hem hit just below where the heel meets the sole that I present the illusion of extra height and get taken much more seriously. It works so well that when I wore flats to work for the first time everyone I worked with was completely floored at how tiny I actually am! This is such a fascinating series of articles! It’s made me really look at how I dress AND how I behave (very yang) which explains so much! I hope you will write more on this topic. Have you got any specific questions or areas that you’d like me to cover on this topic Elizabeth? I have learned from your yin/yang articles. The check list on this one was useful. Yes there is so much to take from Yin and Yang that you can apply in so many ways! 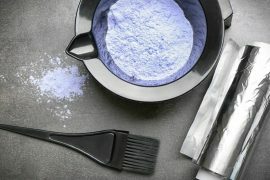 This article is very interesting. I’m a tall woman, 5’8″, & w heels even taller. When I worked professionally, I always wore suits, but as my hair is naturally curly, I have always used it as my “trademark”. My mom taught me to embrace it, so my big, blonde, curly hair is my identify characteristic. Which never quite fit w the “professional suit” look. Once I quit work to be a stay a home mom, my style is much more bohemian. But I’m very comfortable in “commanding” clothes & completely whimsical clothes. I must be a true conundrum. How do you reconcile it when your personality is solidly yang (7 yang,/4 yin), in a predominantly yin physical package (6 yin/4 yang)? I have always felt stuck in a short curvy body that didn’t match my quite “masculine” mind & personality (INTP, which is rare enough and even rare in females.) If you add them together they are balanced with yang predominating. I do not look good in linear yang styling due to a top-heavy hourglass/figure 8 type body. But if I dress for my body no one ever takes me seriously. This may explain why I tend to like somewhat yang clothing. My physical appearance is only slightly more yin but my personality is almost straight up, probably 90% yin – wow. I’ve always felt more powerful and serious when I wear a nice tailored outfit, and one could see this by peeking at my blazer collection.